Lectures, keynote addresses, presentations, workshops, preaching, and film screenings can be arranged. Briefings on migrant safety, the politics of immigration reform, the role of faith communities in public discourse, and consultations on advocacy and nonprofit organizations are available. We will put you in contact with a migrant shelter in Mexico or Central America. Go and visit. Meet the migrants. Find out how you and your group, congregation, or community can establish a long-term relationship with a service provider. We will provide you with a list of things that can be shipped to shelters in Mexico or Central America. Shipping addresses, websites, portals for financial donations, and other information can be shared. We have developed 24-hour video and graphic programs to assist migrants in surviving the journey crossing Mexico and crossing the US-Mexico border. A contribution of $750.00 will provide 24-hour information on a video screen in a shelter and include the costs of site installation. Individuals and groups can arrange to accompany Robin and/or Laura to the shelter site. Guided trips to shelters in Tapachula, Chiapas, Mexico and the surrounding area in Guatemala are available. Bus trips along the migrant trails on route from Tapachula to Mexico City or from Mexico City into the northeast of Mexico can be arranged for larger groups. Numerous migrant shelters are in and around Mexico City. Many institutions and public sector agencies serve these populations. Large populations of deported Dreamers and deportee communities are springing up around the city. Guided tours and meetings can be arranged for reasonably sized delegations. Crime, kidnapping and extortion are the big problems that migrants face as they cross through Mexico. All of Mexico is Narco territory , it is a reality that can not be denied and that the government itself confirms it. There is not a single state where a criminal organization is not established. 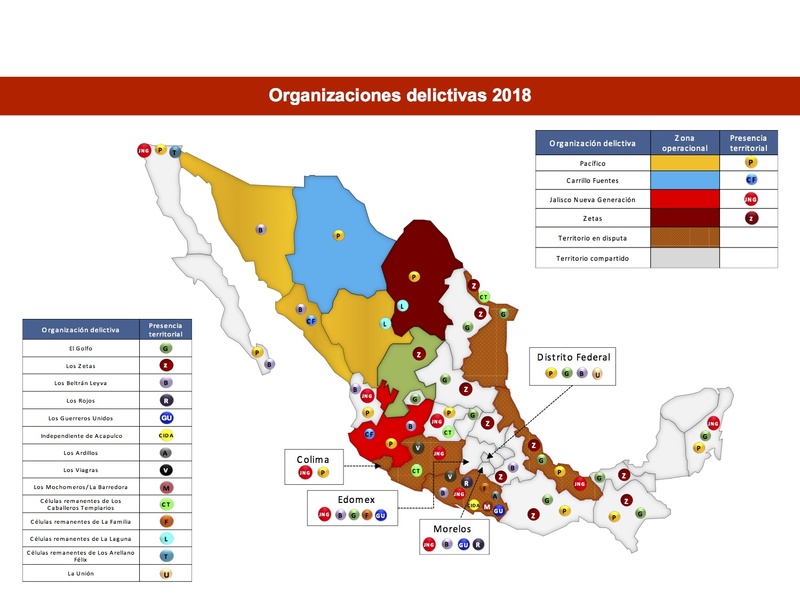 Here is a map of how these Cartels are organized since 2017 in mexican territory. In partnership with the Pima County Medical Examiner's Office, Humane Borders have created an updated migrant death map, formally known as the Arizona OpenGIS Initiative for Deceased Migrants. Map of Red Cross Locations in Mexico. These are the offices of The 'National Commission for Human Rights (CNDH) in every state of Mexico. This is the national human rights institution accredited at the United Nations with the' A 'status by the International Coordinating Committee of the NHRIs (ICC). The Commission is a public institution that enjoys judicial, organizational and functional autonomy from the federal government. Doctors Without Borders teams have been providing patient care along migration routes through Mexico since January 2013. Many migrants need mental health support due to the significant stresses related to conditions in their countries of origin. origin and also in the race. Here you can find the points where Doctors Without Borders works, in the Mexican territory. health services and telephone are provided throughout the population. Here you can download the list. Creating Humane Borders: a migration ethic is available at Amazon.com. Available electronically to students. Laura Garciandia is a journalist living in Mexico City. Born in Havana, Cuba, she has traveled the world and she is bi-lingual in English and Spanish. She has worked with Central American migrants in Mexico for more than seven years. She has visited migrant shelters in Mexico both professionally and as a volunteer to provide services and to deliver donated clothing, medicine, and food. Laura listened to migrant stories and testimonies about the dangerous journey of migrants across Mexico. The idea emerged to create a guide for migrants to enable them to survive their trips. The guide would gather maps, emergency telephone numbers, the locations of shelters and survival tips for crossing deserts, rivers, and roads. She began a modest program of distributing survival guides in shelters and places where migrants gathered. Advice was shared concerning the activities of cartels, especially kidnapping and extortion. She began working everyday to find the most humanitarian routes where caregivers exist. She knew that through cooperation, the basic needs of the migrants could be met and dangers of traveling through Mexico could be alleviated. Rev. Dr. Robin Hoover is a social ethicist who has worked with migrating people along the southwest border of the United States. for 33 years. A native of west Texas, he holds degrees in journalism, religion, social ethics, and political science. The author of Creating Humane Borders: a migration ethic and numerous book chapters and articles, Hoover has appeared in every major media market on earth, testified before congressional committees, and presented in dozens of major universities. He has founded and led several nonprofit organizations which have delivered millions of dollars of aid to migrants. As a pastor of progressive congregations, his energies have been focused since 1980 on organizing congregations, denominations, and volunteers to deliver goods and services to persons crossing the U.S.-Mexico border. Migrant safety, humanitarian, and legal services have been the focus of efforts to improve the lives of migrants. Current efforts are focused on providing migrants-especially from Central America-the information they need to successfully navigate Mexico safely and to survive crossing the border. His life work has been preserved in the Special Collections Library at the University of Arizona, and he has been recognized by many groups with honors and a 2006 recipient of Mexico’s National Human Rights Award bestowed by Presidente Felipe Calderon. Hoover has traveled extensively in Mexico and Central America and worked with elected officials and public administrators in and from more than a dozen countries. Hosting six United Methodist bishops in Altar, Sonora, Mexico. Tours can be arranged in locations from Guatemala to Sonora. Participants can visit migrant shelters and government agencies. Participants can view the migrant trails, camps, Border Patrol infrastructure, operations, facilities, and get an overview of the migration. I travel to universities, conferences, study groups, and events, to make presentations, give lectures, facilitate group discussions, and sign books. Congregations are one of the most important forums for discussing major social issues. I make presentations, preach, guide discussions. Shelters need money, blankets, health kits, toiletries, prepaid phone cards, socks, shoelaces...there is no end to what they can use. Working with elected officials, public administrators, and community leaders, we can ameliorate many of the effects of bad US policies. Copyright © 2018 RobinHoover.com - Todos los derechos reservados.